City of Light. City of romance. Men with no sense of boundaries. Amazing food. Overrated food. Rude waiters. Museum queues for blocks. Fabulous shopping. Snobby Parisians. I’d heard the raves as well as the complaints. Honestly, the first time I visited Paris in 2006, I was prepared to hate everything about it but instead I fell completely in love – and not just the “I like spending time with you” kind of feeling. This was the, “I can’t stop fantasizing about you” kind of attraction. I’ve just returned from my third successful rendezvous. Like my visit last year, this was another 24-hour, carefully designed, layover – a chance to decompress after an intense eight days of conference insanity in Rabat, Morocco. Here’s my winning formula. Take the high-speed train from the airport into the city, check into the hotel, take a hot shower, put on comfy clothes and ballet flats and let the wandering begin. Sometimes I listen to music, other times I leave the earphones in my room and take in the sounds of the city. Scheduling a museum visit hasn’t worked out yet, mainly because I don’t want to waste the precious few hours that I have standing in a line. Yes, I would love to visit the Musée de l’Orangerie and be enveloped by Monet’s Water Lilies. However, I’m just as happy to walk along the Seine, gaze at the stunning architecture throughout the city, or grab a cup of tea at a sidewalk café and spend a lazy hour or two watching the lives of others play out around me. Whittling away an hour of the evening staring up at an illuminated Notre Dame, silk scarf providing a kiss of warmth against the crisp autumn air, brings me indescribable pleasure. And then there’s the food… Unfortunately, with the crush of work in Rabat some nights the only things to pass my lips are the three vodka soaked olives from a dirty martini. By the time I arrive in Paris I’m ready for a three-hour, thousand calorie feast. Thick slices of foie gras torchon paired with plum preserves, and crusty bread. Crispy duck confit rests on a bed of duck fat roasted potatoes and on the side, a simple green salad with flecks of pink shallot from the vinaigrette dotting the leaves. The yolks of over easy eggs tucked into savory crepes stuffed with smoked duck, gizzards, and potatoes mingle with melted cheese to create a simple sauce. I normally don’t eat dessert, but it’s hard to pass up a lemon tart accompanied by a cup of Earl Gray tea – a simple yet remarkable pairing. In the morning, a final meal before the transatlantic flight home – warm flaky croissants and an omelet filled with cheese, ham and herbs. A lanky waiter pauses by my table, pen in the right hand, spiral bound notepad cupped in his left palm. He leans in, “Madam, I’m so sorry you’ve had to wait so long”. Darling please, you could leave me alone at this bistro table for hours and I’d remain perfectly content. 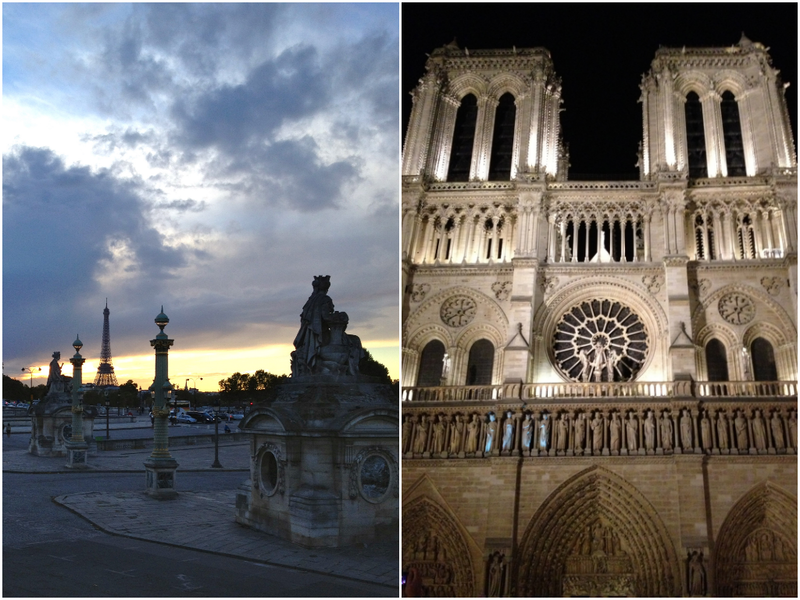 Loving Paris may be cliché, but it’s a cliché for a damn good reason. Yes, there is a technique to making the perfect omelet. But I say, don’t stress yourself out worrying about it too much. Swirl the eggs around the pan, keep the heat medium to low and fold however you like. Remember, it’s a just an omelet! Crack the eggs into a bowl. Add the milk. Season with salt and pepper. Whip with a fork until everything is incorporated and eggs are fluffy. Set aside. Heat the tablespoon of olive oil over medium high heat in a skillet. Once the oil begins to shimmer add the potato rounds in a single layer. Season with salt and pepper. Cook, turning once until golden brown and cooked through. Approximately 2 minutes per side. Remove the slices and drain on paper towels. Add ham to the empty but still hot skillet. Toss until lightly browned and warmed through, approximately 1 minute. Remove and set aside. Heat a new skillet or clean the existing skillet, dry, and return to medium heat. Add 1 teaspoon of olive oil and the pad of butter. Once the butter begins to bubble slightly add the eggs. Tilt the skillet until the eggs cover the entire skillet in an even layer. Work quickly to layer the ham, cheese, and potatoes atop the eggs. Sprinkle in half the herbs. Once the eggs are ¾ of the way set, fold the omelet in half or thirds (whatever you are comfortable doing). Once folded, jiggle around the pan to finish cooking before sliding the omelet on to a waiting plate. Sprinkle with remaining herbs. Paired with a simple green salad, omelets make a wonderful brunch or a light lunch. Great photos. You tried a couple of dishes that I was not brave enough to try in the years that I lived in France! Thanks for sharing this. 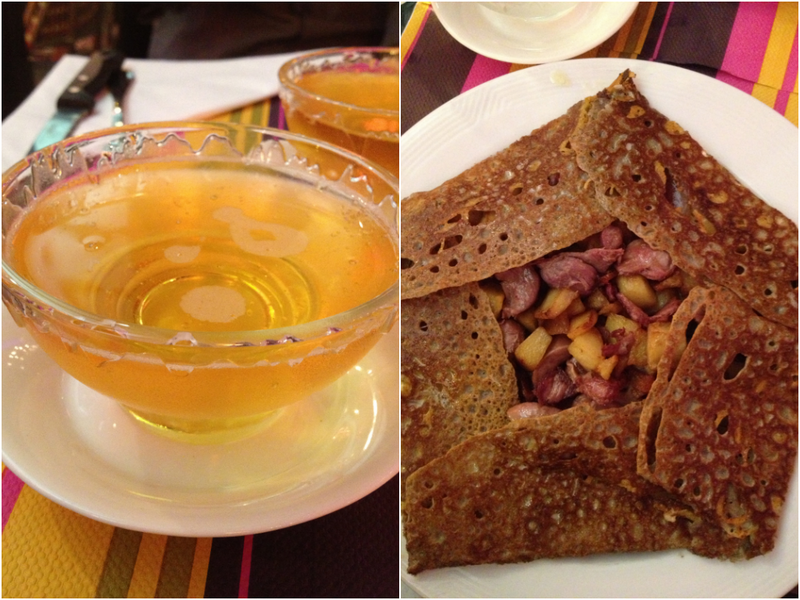 Randomly, I really miss crepes. I just had breakfast, but I’m drooling from how delicious it all looks. Many thanks! Always happy to hear that I managed to make someone hungry!